A brand new trailer for Fantastic Beasts: The Crimes of Grindelwald has arrived. Warner Bros. decided to use part of their presentation at San Diego Comic-Con to focus on the upcoming sequel, which takes place in the Harry Potter universe but long before the events of the original book series. With the movie set to arrive in theaters in just a few months, the studio thought this would be the perfect time to give us a magical look at the return of Newt Scamander, who is battling the evil wizard Grindelwald this time around. Warner Bros. had previously released a teaser trailer that gave us some idea of what to expect, but this full-length trailer may help get the more casual fans of the wizarding world on board with Fantastic Beast 2. The sequel centers on Magizoologist Newt Scamander as he joins forces with young Albus Dumbledore to prevent the devious Gellert Grindelwald from raising pure-blood wizards to rule over all non-magical beings. 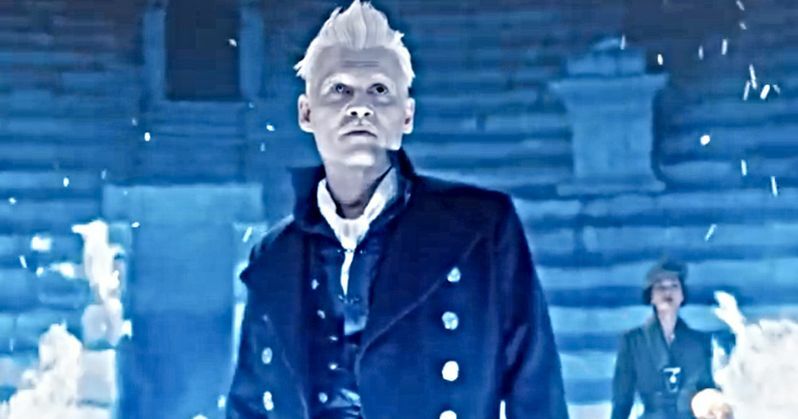 Grindelwald was revealed at the end of Fantastic Beasts and Where to Find Them and, despite the fact that he was in captivity, it was quite clear he was going to be the main villain for this installment. The cast includes Eddie Redmayne as Newt Scamander, Jude Law as Albus Dumbledore, Katherine Waterston as Tina Goldstein, Ezra Miller as Credence Barebone, Dan Fogler as Jacob Kowalski, Zoe Kravitz as Leta Lestrange and Johnny Depp as Gellert Grindelwald. David Yates, who directed the first Fantastic Beasts, as well as the final four Harry Potter movies, is once again in the director's chair. If it ain't broke, don't fix it. J.K. Rowling penned the screenplay herself, just as she did with the first movie in the series. Assuming things go according to plan, there will be a total of five movies in this prequel franchise. Harry Potter is one of the most successful franchises of all time. Warner Bros. had to find a way to keep that going, but with no more books left in the series, they decided to explore the world introduced in the fictional textbook Fantastic Beasts and Where to Find Them. That proved to be a good strategy, as the first movie in this new series brought in $814 million worldwide. Not bad at all, considering that the words Harry Potter don't even appear in the title. Not counting Fantastic Beasts, the eight Harry Potter movies grossed a total of $7.7 billion worldwide. Even without wizard that got things started, fans are still eager to see more adventures in this universe. This time around, the action moves from New York City to Paris in what will hopefully be another winning addition to the expanding wizarding world. Fantastic Beasts: The Crimes of Grindelwald is set to arrive in theaters on November 16. Be sure to check out the brand new trailer, courtesy of Warner Bros., for yourself below.